Challah is bread that is enriched with eggs, and traditionally eaten by members of the Jewish religion on the Sabbath and religious holidays. Similar to brioche, it also makes a tasty French toast. 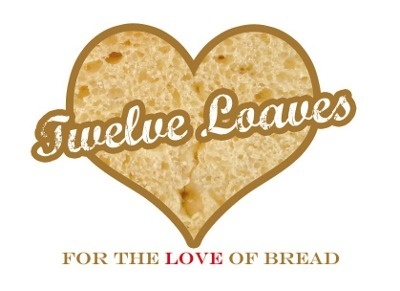 Dave was pretty excited when I told him that this month’s theme for #TwelveLoaves was Jewish breads. Dave’s father’s side of the family is Jewish, and while I grew up on porridge, boiled potatoes and shortbread, he grew up with bagels and lox, brisket and challah. Challah is a yeast bread that is enriched with eggs, similar to French brioche. The biggest difference between the two (other than the religious traditions associated with challah) is that brioche contains butter (and a lot of it!) while challah contains oil. If you’re not concerned with keeping kosher, feel free to substitute butter for the oil in your challah. 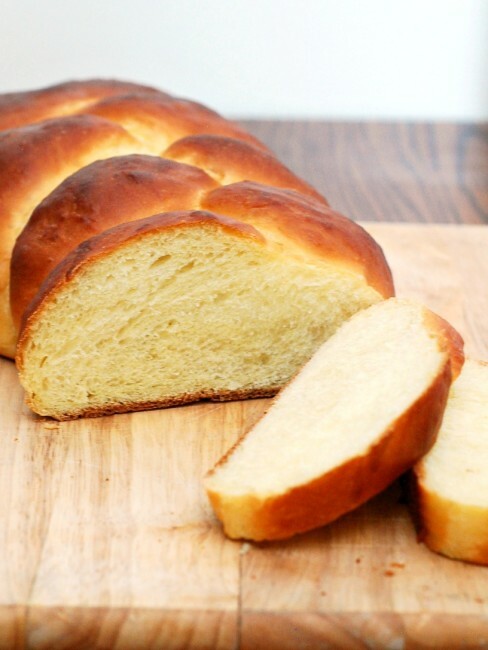 Brioche is often shaped in a knot, while challah is often braided. This is a pretty easy yeast dough to make. The stand mixer does most of the mixing and kneading work. The rich dough isn’t as stiff as something like white sandwich bread dough, but try to resist the urge to add more flour. The dough should not form a ball when the dough hook is kneading. Forming the dough is pretty straightforward as well; it’s just a simple braid. Starting from the middle gives you a finished look at both ends of the bread. 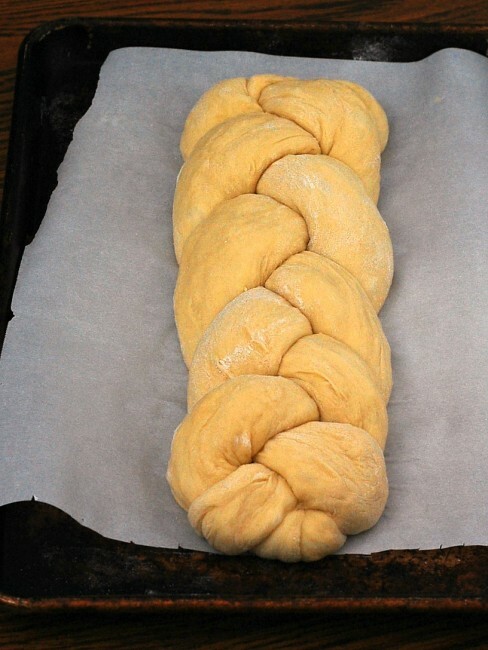 If you want to get fancy, there are tutorials on 4-braid (or even 6-braid) challahs. Or, you could simply roll the whole loaf of dough into a log and bake it in a large loaf pan. Combine the flour and yeast in the bowl of a stand mixer fitted with the beater attachment. Stir briefly to evenly distribute the yeast. Add the water, eggs, egg yolks, oil, sugar and salt and mix on low speed just until all the ingredients are mixed. Switch to the dough hook. Knead on low speed for 4 minutes, then increase speed to medium and knead another 4 minutes. The dough should be soft (it won't form a cohesive ball) and slightly sticky. Transfer the dough to a large mixing bowl greased with nonstick spray. Spray the top of the dough with nonstick spray, cover the bowl with plastic wrap and a kitchen towel, and set aside in a warm, draft-free place for the dough to rise until doubled in size, about an hour. Gently deflate the risen dough, fold it in half and let rest, loosely covered in plastic wrap, another 20 minutes. Divide the dough into 3 pieces. On a lightly floured surface, pat each of the 3 pieces into a 6- by 10-inch rectangle. Working with the long edge further from you, fold it toward the middle, pinching it with your fingertips to seal the dough together, until you form a tight spiral. Repeat with remaining pieces of dough. Gently roll each spiral into a rope about 12 inches long. Line a baking sheet with parchment paper. Place all 3 ropes parallel to each other on the parchment. Beginning in the middle, place the left rope over the center, then the right rope over the center, until you've braided to the end. Pinch the ends of each rope together and gently fold under the loaf. Rotate the pan 180 degrees, and repeat with the other side. Whisk together the egg white and the cold water, and use a pastry brush to gently brush the egg wash over the loaf. Let the dough rise, uncovered, for an hour. Preheat the oven to 350 degrees. Bake the loaf until it is dark golden brown and feels lightweight, about 25 to 30 minutes. Let cool completely before slicing and serving. Our host this month is Karen from Karen’s Kitchen Stories, and our theme is Jewish Breads. For more bread recipes, visit the #TwelveLoaves Pinterest board, or check out last month’s mouthwatering selection of #TwelveLoaves enter last month’s “A Little Something Sweet” Breads! If you’d like to bake along with us this month, share your Jewish bread using hashtag #TwelveLoaves! Your bread is absolutely gorgeous….I love challah! I’ve never attempted making it though…it looks so daunting. Your directions look easy enough to follow though! If you have a free moment on Thursday, I’d love it if you stopped by our #FoodieFriDIY party and shared it with us…we go live at 9 pm EST! Hope you are having a great week! Challah is one of my favorite breads ever and yours is beautiful! Thanks for sharing it. Just a gorgeous challah, I love that bread so much especially in French toast. I’ll have to add it to my must-make list. Your braid looks perfect! 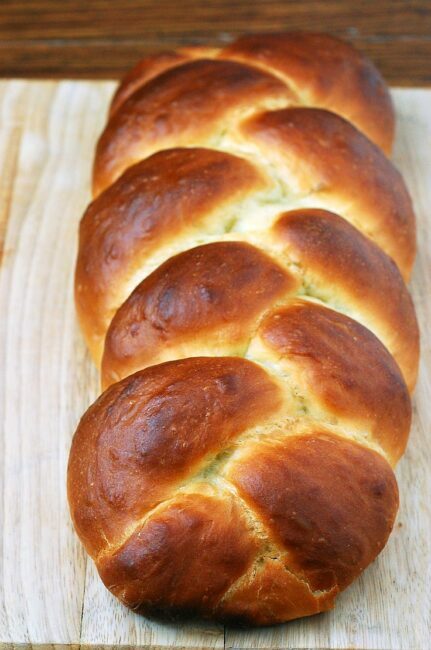 Seriously, you can’t go wrong with a beautiful challah…pass me a slice. Great braid, wonderful golden colour, perfect crumb 🙂 Really want this for breakfast tomorrow! Really want this for breakfast tomorrow! Gorgeous challah Coleen! Bet it is as delicious as it looks…I can understand why Dave would be a happy camper with this bread…P.s. You are inspiring me to try my hand again at braiding!!! Your challah is simply stunning! I love the nice even yellow crumb you achieved too. I bet your husband was happy! 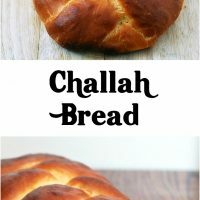 I LOVE challah bread, but have never made it myself. I can’t wait to try your recipe soon!